Magnetic Effects of Electric Current Class 10 Notes are prepared strictly according to the latest NCERT Syllabus on the guidelines by CBSE. These notes are prepared by our panel of highly experienced teachers keeping in mind the level of preparation needed by the students to prepare for Class 10 board exams. 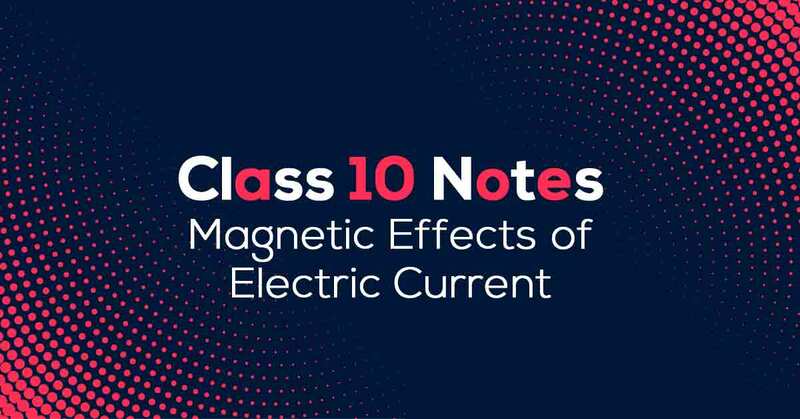 Magnetic Effects of Electric Current Class 10 Notes aims at easing out your learning and revision process. Describe Magnetic Effects of Electric Current? The magnetic effect of electric current is known as electromagnetic effect. It is observed that when a compass is brought near a current carrying conductor the needle of compass gets deflected because of flow of electricity. The imaginary lines of magnetic field around a magnet are called field line or field line of magnet. Field line of a magnet can also be detected using a compass. Magnetic field is a vector quantity, i.e. it has both direction and magnitude. Learn more about the same in Magnetic Effects of Electric Current Class 10 Notes pdf.